Every year I like to try a new pumpkin beer, because I’m just festive like that. 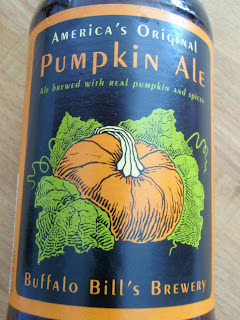 Most of the time they’re disappointing, either lacking character or just too heavy on the spices and “flavoring.” This year I was pleased with the pumpkin ale from Buffalo Bill’s Brewery in Hayward, CA. It’s a sturdy ale with strong hints of clove and a little pumpkin in the aftertaste. It’s one of those beers you may not like right at the first sip, but it grows on you—give it time.